Weathered Oak upholstered linen dining chair, a solid oak curved back dining chair with a natural, robust oak weathered finish. 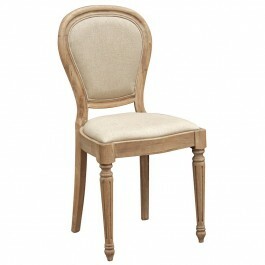 The front legs are fluted and the back ones curved with round back frame and comfortable upholstered linen seat and back. Weathered Oak upholstered linen dining chair, a solid oak curved back dining chair with a natural, robust oak weathered finish. Fluted front legs and curved back legs with round back frame and comfortable upholstered linen seat and back pad.